Freemantle Media is adapting Neil Gaiman's novel American Gods for television. Neil Gaiman announced yesterday that two of his novels were receiving TV adaptations. 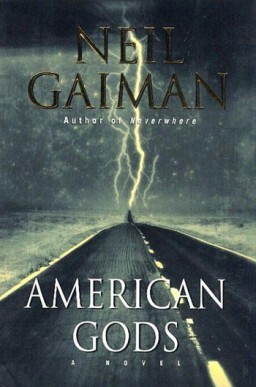 Freemantle Media will adapt American Gods as a TV series, and RED will adapt Anansi Boys into a TV miniseries for BBC. American Gods was originally going to be adapted for TV by HBO, as it had an option for American Gods for years, even going through three pilot scripts. However, HBO has only so many slots and eventually passed it along to Cinemax (within HBO), which then decided to pass on it. Tom Hanks' production company Playtone was going to work with Gaiman for the TV adaptation, but the company is exclusive to HBO. Recently Stefanie Burk, who worked for Playtone, moved to Freemantle Media and was determined to bring American Gods to screens, Gaiman said. He will also be an executive producer to the series. "As to where you will be able to see it, who is going to be in it, who will be writing or show-running, none of these things have yet been settled," he said. "But it already looks like it's going to be a smoother run developing it than it had at HBO, so I am very pleased." The premise of American Gods is that gods and mythological creatures exist because people believe in them. However, the strength of their power corresponds to the strength of people's beliefs. Now that people's beliefs have waned, these gods' powers have weakened, and new gods have arisen to reflect people's obsession of media, celebrity, technology, and drugs. Gaiman also has very little news about RED's adaptation of Anansi Boys, and RED has not formally announced this. Anansi Boys is a story of two brothers who discover each other and explore their heritage after their father's death. Their father was an incarnation of the spider god, Anansi, but one of the sons had not inherited any powers as the father's powers had passed down to the other son. Gaiman, who also created the Sandman comic series, said he is "really thrilled" about the TV adaptations of both novels. "Freemantle has the harder task, as they are going to have to open up American Gods into something bigger than the book," he said. "Red are just going to have to make an absolutely brilliant faithful version of Anansi Boys."